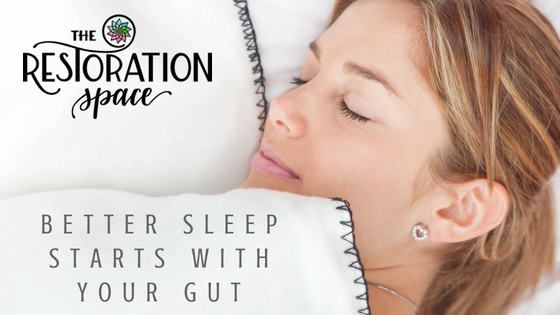 Better Sleep Starts with Your Gut… Really? Getting good sleep may not start in the brain but rather in the gut. The microbial makeup and health of the gut, known as the microbiome, is incredibly pivotal to brain health and sleep. The microbiome actually sends hundreds times the messages to the brain as the brain sends to the entire body and why the digestive tract is now being called the second brain. Healthy gut bacteria are responsible for producing over 90% of serotonin in the body along with other critical neurotransmitters like dopamine and GABA. Serotonin is the precursor to the critical sleep hormone melatonin. Amazingly, the gut contains 400 times more melatonin than pineal gland that produces melatonin in the brain. Factors like antibiotics, sugar, medications, processed foods, food intolerances, environmental toxins and continual stress all adversely affect the microbiome, making it a hostile environment for good bacteria. These stresses on the gut put the inner ecosystem out of balance and can downregulate the production of serotonin. This not only lowers your “feel good” hormones throughout your day, it in turn lowers melatonin production resulting in poor sleep at night. Optimizing the health of your gut may be one of the most impactful things you can do for sleep and overall health. Avoiding sugar and processed foods, reducing carbohydrates and consuming a wide variety of vegetables is a good place to start. Additional support for the microbiome can come through fermented foods, quality grass fed proteins, bone broths and healthy fat like coconut and olive oil. There are over 1000 species of bacteria contributing to every function in your body. With more bacteria cells in the gut than human cells in the entire body, the expression “it is all in your head” needs to change to “it’s all your gut.” Better sleep may be from a healthier gut.